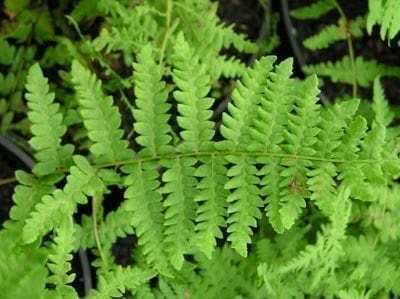 The Marsh Fern has lanceolate pale green fronds with short, widely spaced pinnae which are held erect. It enjoys damp shady spots and is particularly good near water. A lime hater, it prefers acid soils. Deciduous and native, it spreads by rhizomes and naturalises well. This fern can also be used as an aquatic marginal. Planting depth in water 5cm/2in. If you have wet or boggy ground in some shade this plant will soon colonise it. Not invasive, it is easily controlled if it outgrows its allotted space. Deciduous, so remove old fronds in early spring – however you dont need to do this if you are growing it in a wild place. Over time it will dry boggy areas out. Division in spring is simple and by far the easiest way to propagate this fern.